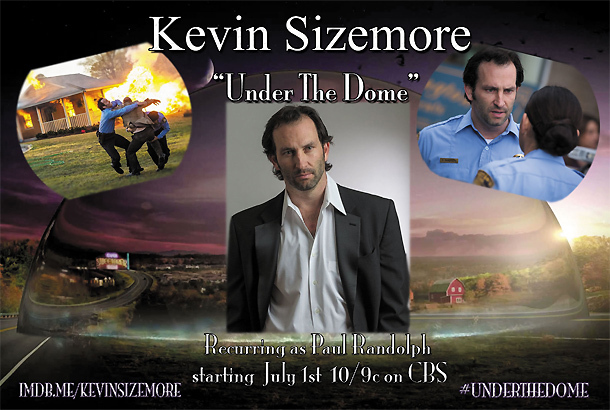 Kevin Sizemore will make his Under the Dome debut tonight (July 1) as officer Paul Randolph. It took Stephen King over thirty years to finish this unique and fascinating story which CBS now brings to homes all across the world. 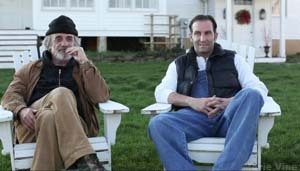 The first episode alone landed over thirteen and a half million viewers. We caught up with Kevin to talk about surviving disasters (as seen on TV), keeping the faith, having some fun, the importance of family and the crazy path which brought him to Los Angeles. MV: Welcome to Movie Vine, Kevin. To begin let’s discuss Under the Dome. Would you mind sharing a little bit about the story premise? Kevin: Under the Dome takes place in a small town called Chester’s Mill on the East Coast. Everyone knows everyone in this town, and every day is a normal day until an invisible dome falls over the entire town. It feels like an earthquake is shaking the ground. Equate that to walking outside your door to your car and … BOOM! You run into something. You can’t see it, but it’s there. That dome is doing that to the entire city so if you’re driving, or you’re riding your bike, you’re going to crash right into it. So now this whole town has to figure out what it is, how big it is, and is there a hole so can we get out. When there are no answers or signs the town starts to freak out. MV: Is your character, Paul Randolph, actually stuck within the confines of the dome? Kevin: Yeah. I’m inside and part of a small group of law enforcement. Paul Randolph is a do first and think about the consequences later kind of guy. There’s a lot of times Paul does things that people won’t be too happy about. He thinks he’s doing it for the right reasons. MV: What are some of the questionable things he does to keep order in the chaos? MV: (laughs) Over time do you think the townsfolk will continue to respect the law’s authority, or will there be some sort of anarchy? Kevin: Well that’s where Big Jim comes in. Big Jim is a used cars salesman who is kind of a big figure in this town. He feels like he wants to take this town and call the shots. When you are under a dome, and separated from friends and family, there’s a lot of confusion and terror that sets in for everyone. You have no verbal communication. The only communication you have with the outside is if you write something on a piece of paper and they can read it. But, that’s it. Having the dome fall over Chester’s Mill is bad enough, but just wait and see what else happens that Big Jim, Randolph and everyone else has to deal with! MV: How would you describe the sense of community that small town people have? Kevin: Everyone looks out and takes care of one another. You don’t lock your doors. Everything is at a slower pace, and you don’t have to worry about your kids playing outside. Everyone has a very relaxed, calm, easygoing sense about themselves in small towns. But, don’t take that for a lack of hard work. Folks work very hard in small towns, and they are a very proud people. What they get … they deserve and work hard for. It’s just a different mentality in small towns. When you’re in a larger city, there is always a rush and it’s hard for people to just slow down. We live in such a fast paced world that I think we’re losing the bare necessities of life. Enjoy people and enjoy something about the day instead of just trying to get something from someone. Life goes past us way too fast! MV: If the dome were to land here in L.A. it would be survival of yourself. But, in a small town when something like that happens the community comes together. Kevin: You’re right. If I’m in a small town such as Chester’s Mill, I know for a fact that if a dome came over my hometown of Princeton West Virginia, the residents there would do everything they could to help someone. Not to say that it wouldn’t happen in L.A., but what I’m saying is I feel in a larger city that there are so many people … it would be a lot more difficult. It should come down to what kind of a person are you? If that resonates to other people then you can be in the biggest or smallest city in the world and things will work out. MV: That’s true. What are some of the difficulties the cast or crew had bringing a Stephen King novel off the page and onto the screen? Because in the novel you have a beginning, middle and end. However, in the TV series you can go on for as long as they let you. Kevin: Yeah. The issue we had here was taking many characters from the book and putting them in a mini-series. I know that there are probably four or five characters blended into my character alone. With so many characters, there’s no way you can go through everyone’s life in thirteen episodes when the novel had a thousand pages to do so. Where they go with it will be exciting for the fans. I’m just excited to be associated with a show people are talking about, and enjoying in over two hundred countries. MV: While filming did you discover any unique survival tips? Kevin: Yeah … run fast! You’ll see what I mean in upcoming episodes. MV: Let’s talk about your film Red Line. It also deals with people under extreme distress and crisis. What can you tell us about the story and your character Jared? Kevin: I love this film that’s directed by Rob Kirbyson (who also did Snowmen). It’s a film from Yellow Line Studio. I play opposite of Nicole Gale Anderson and John Billingsley. My wife and daughter (Kym Jackson and Renee Sly) are visiting Los Angeles, California for vacation and get on the Red Line metro train. The next thing you know, we are stuck nine-hundred feet under the ground with no way to get out. 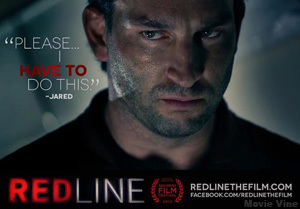 You can watch the trailer at redlinethefilm.com, and it can pre-ordered on Amazon now before the July 23rd release. MV: I like how it was created and crewed by interns and students then they had professionals come in to help them. What was your experience both on camera and off while creating in a learning environment? Kevin: John Paul the Great Catholic University students in San Diego took the challenge and nailed it! One of their students, Tara Stone, was the writer also. Department heads were brought in to oversee certain departments, but for college students to have this kind of opportunity is amazing! They get to work on a film with professional actors, and they got Red Line distribution all over the world. You don’t do better than that when you’re in college. The students did a wonderful job. As actors, our job is to take words off the page and made them believable. Their job was go to school and shoot a movie … at the same time! I really can’t wait for everyone to see this project on July 23rd. MV: You filmed Red Line on their brand new sound stage, right? Kevin: Yeah. They have a sound stage on their facility. We shot this whole film, except for a day and a half of exteriors, on a sound stage. They built the underground train, the tunnels and everything was shot in a big room. I mean if you were to have walked in the room to see where we shot this film, there’s no way you would have believed it. To see what they put on the screen compared to where we shot it is mindboggling. MV: In Under the Dome you are stranded with a group of people you know, how does that differ from Red Line where you are in this small confined space trapped with a bunch of strangers? Who do you trust, and who do you lean on? Kevin: In Red Line we had a subway car, and the only way we were able to go anywhere was when we went from car to car. You can only go one of two ways … forward or backwards. So once Jared realizes the circumstances he’s up against, he knows he can’t trust anyone, and no one can trust him. Jared has a lot of struggles he had to deal with … physically and emotionally! Some people will say “I can’t believe you handled it that way because you’re ruthless”. Others will say “I would have done the same thing for my family”. We’re gonna get a lot of different opinions about my character. Which is fantastic, that means I did my job. MV: How would you do things differently as a husband and father if, God forbid, you were in the same situation? Kevin: You know, there is a lot of me in what Jared did. There are two or three things I would have done differently which probably would have made things worse to tell you the truth. (laughs) I’m a leader by nature and like to get things done. I like to make sure that it gets done right or to the best of my ability. MV: What can you tell us about A Christmas Tree Miracle? Kevin: It’s the first film I was able to shoot in my homestate of West Virginia! I play opposite of Terry Kiser. A lot of people know him from Weekend at Bernie’s. Terry is such a talented actor and we had a blast! The script was written by Ty DeMartino and directed by J.W. Myers. It’s a story about the George family who has everything: beautiful family, wonderful job, plenty of money, we can do whatever we want, and then one day reality sets in when I lose my job. Once we realize that I’m not getting a job, things get bad fast and my family dives into downward spiral. How we handle that situation is what is going to touch a lot of America, because through the last few years the economic pitfall we’ve had in this country simulates a lot of what happens in this movie. Hopefully people will get strength from what they see, and realize the most important thing you have is your family. MV: You are working on a 168 Film Project. Would you mind explaining a little about the competition? Kevin: John Ware is the creator of the 168, and it’s a faith based Christian film festival. You have one hundred and sixty-eight hours to create a film start to finish. That’s pretty much the gist of it. The producers choose who they want as their director, crew members and actors. They will choose a Bible verse, and whatever verse you get has to coincide with the slogan of the film festival. Let’s say, for example, this year was ‘atonement’ so once you get your verse you have a few days to put together your team, and write the script as fast as you can. When you roll the camera (everyone starts at 11:00am) you have a exactly one hundred and sixty-eight hours to start and finish: shoot, edit, post, music, the whole nine yards of a your short film that can’t be more than ten minutes. That in itself is a challenge because everyone wants to put forth great work. Sometimes you have a huge film crew, and sometimes you have the little guy back in a small town thinking “you know what, I have a video camera and a laptop so I’m going to create a movie”. That’s what’s awesome because everyone gets a chance to compete. This year Echolight Studios is awarding the winning director of Best Film, a one million dollar production opportunity to possibly work with Echolight on one of their future projects that will have distribution. Which is really cool! MV: Yes, that is. Your film this year is Heartfall, correct? Kevin: Yes. This year our verse was Leviticus 1:4: “You are to lay your hand on the head of the burnt offering, and it will be accepted on your behalf to make atonement for you.” The best thing about me doing this year’s film is my son, Gunnar Sizemore, played one of the lead characters along with Reagan Kilpatrick (an eight and thirteen year old). The film is directed by Joth Riggs and our cast also had Jenn Gotzon, Sue Wood and myself. It premieres August 10th at the 168 Film Festival in Glendale, California. Visit 168film.com for tickets to the festival. MV: How many 168 films have you been a part of? Kevin: This is the third one in a row that I’ve done. My first two Useless and Shaken were produced by Matthew 6:33 Films. In Useless (view it at uselessmovie.com) Brandon Adams was our director, and we were fortunate enough to win Best Film, Best Cinematographer, and I was blessed to win Best Actor. We also won Best Film at the San Antonio Independent Christian Film Festival this year, and won the two hundred and fifty thousand dollars production deal from Echolight Studios to possibly take part in doing a feature. How cool is that? MV: Very cool! Both are really good. I also noticed that Gunnar made an appearance in those as well. Kevin: Thanks! Gunnar has been doing wonderful and learning so much! He’s just a normal kid who has a really cool hobby. He sees what daddy does and mommy also. Gina is a strength and conditioning coach, author of Deadline Fitness, as well as doing a lot of work in the media (ginalombardi.com). He sees us having fun with it, and decided to be a part of it all. He’s really made headway in the voiceover world. Thanks to his teacher Susan Boyajian who has taught him the ropes. He just wrapped The Prophet with Selma Hayek and does tons of ADR, narration and looping. He just narrated Swimming In Air for the Weinstein Company as part of the Lexus Short Film Challenge. He does cartoons like Doc McStuffins and did a pilot called Miles from Tomorrowland for Disney Jr. with Julie Bowen from Modern Family as his mom and Tom Kenny who is SpongeBob as his dad. So he’s tapping into this wonderful world of fantasy. Gunnar loves playing the guitar, dancing, plays the piano and school. 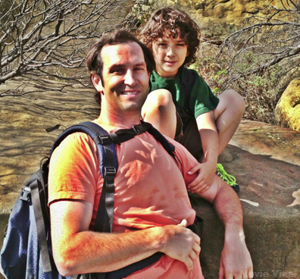 His friends are so important to him, and my wife Gina and I are very blessed to be able to share in his adventures! MV: What advice do you give him as he starts to branch out on his own with his career? Kevin: “Do unto others as you would have others do unto you” Matthew 7:12. If he treats everyone else the way he wants to be treated, he’ll be just fine. You have to give everyone two or three chances because you don’t know what they’ve gone through that day. They might have had a death in the family, or it could have just been a bad day … we don’t know what happened. Be a leader and not a follower. It’s ok to kind of do things that other people are doing, but when your conscience tells you that it’s wrong, you better run and get away from it. Being associated is as bad as being in the middle of it. I’ve told him to make sure to have fun doing what we’re doing … whatever it is! Acting and doing voiceovers is a very difficult job. It’s not easy, but it’s supposed to be fun. And, if this is what you want to do, then do your best at it and enjoy it. MV: Do you have a hard time separating yourself as his dad when working with him? Kevin: Yes and no. It’s not my place to jump in and give advice, and I have to let the director do his job. If the director knows I’m an actor, and they ask me, then I’m game! Gunnar looks at me completely different when we’re on set. When we’re at the house he’ll tackle me, wrestle me, and do whatever he wants to do. We’ve raised him to be very independent so we don’t have to tell him everything to do. He’s a very smart boy. He knows what he should and shouldn’t do. Now when we walk onto a movie set he watches me like a hawk. He loves watching me work. But, we also understand that when we’re at work, we’re there to work. So there’s a fine line of us hanging out there, goofing off and just playing. We’re there to really get our job done. And, at the end of a scene he’ll walk over and go “dad, that was a great scene. I loved how you did this.” So he’s there studying which is really cool for me to see, and I learn watching him also. You’re never too old to learn. MV: Would you mind sharing your journey into acting? I think it’s a fascinating story. And, since you are raising an actor I think it would be great to hear about how you first got your start. Kevin: There was a Maxwell House coffee commercial coming through town. My mom and my dad allowed me to take school off to audition. I ended up getting the job. It was not a big job. I was an extra in a big commercial. That’s it. But, it gave me a taste of what it could be like to do this business. After that I went to college at the Art Institute of Pittsburg and moonlighted doing films like Innocent Blood, Bob Roberts, and any project I could get my feet wet in. I moved to New York City and realized I had no money to do anything at all. What was I doing? After about six months I ended up going to Greenville, South Carolina where my brother Jeff moved. He and I have always been close. While there I started doing a lot of theatre, commercials and print-ads. I worked with a company called Millie Lewis owned by Barbara and George Correll. It was a great time getting my feet wet there, and they treated me so well … just spoke to George last week actually. That’s really where I got my training. Center Stage theater was my home for two years, and I still have friends there from those days. I learned a lot about theatre. MV: I think that is the best kind of training. Kevin: One weekend I decided to go to Nashville because a casting director was going to be there, and I wanted to learn more about the business. I took a lot of clothes with me in case I were to stay longer, and the next thing you know after the seminar I ended up staying in Nashville. I was able to find an agent quickly, but I told her that “if I don’t have a place to live, there’s no way I can stay”. I actually slept in my car for a week in hotel parking lots, and every morning I would wake up surrounded by my clothes, and a car visor, because I didn’t want them seeing in my windows and see me sleeping. I’d walk around to the back of the hotel where someone would always let me in. We would walk out the main door together where I would make small talk, and because they would be checking out they would be dangling their keys and I would see what room number they were in. I’d walk out with them and I would yell “hey guys, I’ll see you in a minute”. Then I would run back into the front desk and say “oh, I’m with those guys and I left my wallet, I think we were in room twelve can I get that key real quick?”. They’d give me the key and I’d run upstairs to shower. So, that’s how I survived for the first week and a half in Nashville till my agent helped my find a place to live. What’s funny is that I did the same thing at a YMCA and I so badly wanted to ask the girl out who ran the front desk, but I couldn’t because then she’d look up my account and know I wasn’t there so I never did. (laughs) That would probably be my first co-star role! 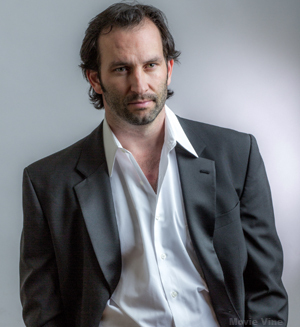 I did music videos for the Bellamy Brothers, Lisa Brokop and Terri Clark’s “Emotional Girl” before shooting a Toyota commercial that led to me getting into the Screen Actors Guild as an actor. I moved next to Orlando Florida and worked at Universal Studios while continuing to do more commercials before moving L.A.
MV: And, haven’t looked back. Kevin: Yeah. That’s my story. Now I’m getting a lot of work here and there and everywhere. I just shot three projects back in Atlanta in the last three months. Under the Dome was shot in North Carolina. My episode of Necessary Roughness comes out on July 10th. MV: So once you got settled in L.A. they start sending you back to the South. MV: How have you managed to keep your faith strong even though you sometimes have to work in a compromised environment? Kevin: That’s not easy because I’ve been offered so many projects that are just nowhere near where I want to go as a person or as an actor. You have to also understand that people say “yeah, but you’re an actor, you’re acting”. Yeah that’s correct, but there are still lines people won’t cross. Is the project in question something that you’ll be proud of? If you don’t get excited when reading it, you’re not going to enjoy doing it. I’m not going to do just any job because you pay me ‘x’ amount of dollars. It’s not worth it. MV: Yeah, it is definitely not worth the compromise. Kevin: I just did a movie called Can I Get a Witness Protection, which is a faith based ensemble comedy directed by Robert G. Lee. It is a hoot. It’s funny. It’s great. I can’t wait for this thing to come out. It’s going to be out in early 2014, and the reason why I’m really looking forward to this film is because there are not many good Christian comedies and all the actors are professional actors … which makes a huge difference. MV: Absolutely! When a production uses professional actors it is much more believable for the audience. Kevin: There you go. The best person for the job and not Uncle Larry’s nephew because he works for free … ha! That’s why I’m so happy to be a SAG member. MV: What do you have planned for the summer? Kevin: I will be at Comic-Con July 20th with That’s My Entertainment. MV: Have you been to Comic-Con before? Kevin: Never. Looking forward to it. It’s going to be fun. MV: Will you be doing a panel, or just signing? Kevin: No, I’m going to be there signing and giving away the big prize of the night. MV: Oh, you are in for a treat! Last question, if a dome landed over your house stranding you on the outside, what items stuck inside your home would you miss the most? Kevin: Wow. I’m a pretty simple guy when it comes to materialistic stuff. I would bring my Bible. A necklace my wife gave me that has my son’s birthday and our wedding anniversary on it. Also a leather band-like bracelet that I wear quite often that says ‘GUNS’ for my son Gunnar. Lastly, a few photos of my family, (my parents, brother and his family, my wife’s family, and of course my wife and my son). My family are so important to me!!! MV: That is the perfect answer. Thank you so much for hanging out with Movie Vine, Kevin. I’m looking forward to seeing you on Under the Dome. Kevin: Thank you for taking the time and have a blessed day! *For more information on Kevin visit his IMDB. Follow him on Facebook, Twitter, and Instagram. 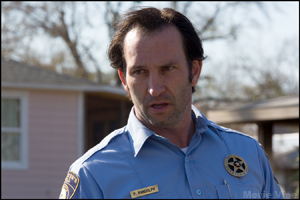 If you like Kevin’s character be sure to trend #Randolph on twitter AFTER the Under The Dome episode airs and tag Kevin (@KevinSizemore). Feel free to leave comments at @UnderTheDomeCBS and #UnderTheDome, or at UnderTheDomeCBS on Facebook. Comments for Chances with Kevin Sizemore are now closed.